Bridge of Orchy lies on the A82, the main road up the west side of the central highlands. For the motorist heading north it is little more than a small collection of mostly white buildings grouped around the Bridge of Orchy Hotel. And for most it is only briefly glimpsed in passing as thoughts start to leap ahead to the surreal landscape of Rannoch Moor and the majesty of Glen Coe beyond it. 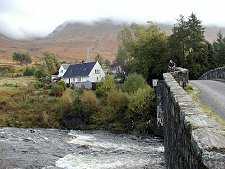 The story of Bridge of Orchy is a story of travel and of travellers. To the average motorist on the A82 the reason for the name isn't at all obvious. But turn west at the small crossroads by the hotel and you move from the "new" A82 built in the first half of the 1900s to its predecessor, dating back to 1751. In the years after the 1715 Jacobite uprising (and again after the '45) the government put a huge amount of effort into building roads and bridges over the length and breadth of the Highlands. Until then drove routes had existed to move cattle to the lowland markets, but most travel took place by sea, and most significant settlements hugged coasts or major rivers. This bout of road building was intended to provide a means of moving troops quickly around the interior to suppress rebellion. These were the military roads built by General Wade and later by Major Caulfeild. They built some 1,200 miles of road and 700 bridges in the years from 1725 and 1767, and in doing so they transformed the Highlands. 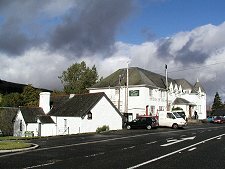 The old military road crosses the A82 at the crossroads in the centre of Bridge of Orchy, before descending past the hotel to the 1751 bridge over the River Orchy, also built by Major Caulfeild. The bridge gave the village its name. From it the old road carries on round the western end of Loch Tulla to Forest Lodge. In doing so it passes the Inveroran Hotel which can trace its origins back even further than the bridge, to 1708. Beyond Forest Lodge the old road is closed to motorised traffic as it carries on to Glen Coe, though it now carries the pedestrian traffic generated by the West Highland Way. 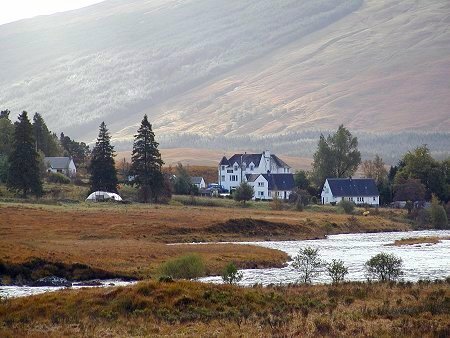 In many ways, the West Highland Way can be seen as the most recent route to be developed through Bridge of Orchy, and it brings a steady stream of travellers to and through the village at a pace slow enough to appreciate it. 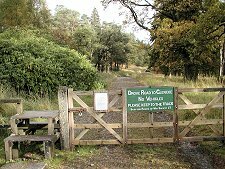 As they approach the village from the south, walkers on the West Highland Way see first hand another of the transport influences on Bridge of Orchy: as they walk alongside it for most of the seven miles from Tyndrum. 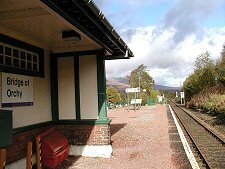 Bridge of Orchy station lies a couple of hundred yards east and uphill from the hotel, and is on the West Highland Line from Glasgow to Fort William. With this, Bridge of Orchy can boast a nearly full set of transport links. Bridge of Orchy is also popular for two other reasons. 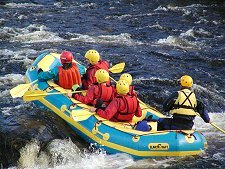 One is the use of the River Orchy here by canoeists and white water rafters, though this owes less to transport than sheer adrenaline. Another significant attraction is the climb of the dominant summits of Beinn Dorain and Beinn an Dothaidh. These two Munros, at 3,524ft and 3,267ft respectively, tower over the village and lie immediately to its east. Access is via a path leading up to the bealach between the two from the underpass beneath the railway at the station. Walkers are encouraged to use the new car park near the hotel rather than the station car park.